In-vitro Diagnostic Services Market size is set to exceed USD 63 billion by 2024; according to a new research report by Global Market Insights. Developments in diagnostic tests will enhance in-vitro diagnostic services industry growth over the coming years. Integration of advanced technology within the diagnostic devices should propel in-vitro diagnostic services market growth in the upcoming years. For instance, Phenomenex, a leader in developing diagnostic tests has added improvisations in the HPLC columns that enables free chiral screening service proving beneficial for performing diagnostic tests. Increase in technological advancements will enable automations in testing equipment utilized in the diagnostic procedures. Growing prevalence of chronic diseases such as cancer should have positive impact on the demand for in-vitro diagnostic (IVD) services. According to WHO, in 2015, there were around 8.8 million deaths globally due to cancer that will augment demand for IVD services. Also, as reported by World Cancer Research Fund International, there were around 1.4 million cases of colorectal cancer globally that will assure inflated demand for diagnostic services in forthcoming years. However, excessive cost of the diagnostic services and software utilized will restrain the industry growth. Testing services segment will grow at 5.7% over the forecast timeline and the high segmental growth will be attributed to the availability of superior quality in-vitro diagnostic services. Moreover, increasing mortality rates due to cancer and other viral infections should augment the business growth over forecast timeframe. Laboratories segment held an enormous market share of 29.3% in 2017 and is anticipated to follow high growth trends in upcoming years. Increase in rate of detection of diabetes cases in South African and Asian countries will augment the segmental growth and escalate the demand for in-vitro diagnostic services. Additionally, growing incidence of chronic infections such as HIV and others will ensure high demand for laboratory diagnostic services. According to U.S. Statistics, around 1.1 million people in the U.S. were infected with AIDS that will positively influence business growth. U.S. market accounted for 89.7% regional revenue share in 2017 and high business growth can be attributed to the increasing geriatric population suffering from chronic disease such as diabetes. As per CDC in 2015, around 30.3 million Americans were detected with diabetes that should upsurge the demand for diagnostic services in near future. Also, developments in healthcare infrastructure will positively impact the business growth. 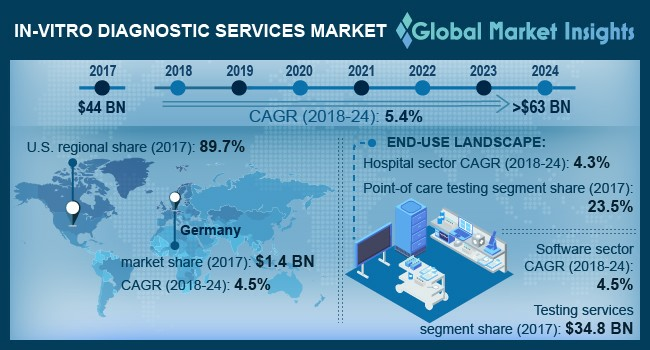 Germany market was valued at USD 1.4 billion in 2017. Business growth in the country will be triggered by rising adoption of technologically advanced diagnostic devices. Also, availability of improvised quality diagnostic devices used in blood, urine and other infectious diseases diagnosis coupled with development of reimbursement scenario will stimulate industry growth over the coming years. Some of the prominent industry players operating in the BioRad, DexCom, Nova Biomedical, OraSure, Pearl Pathways, Phenomenex, Qiagen, Roche diagnostics, Siemens, Sysmex and Thermofisher. The key industry leaders will assure maximum profits by introducing innovative technology & devices into the industry. For instance, in October 2017, Roche Diagnostics received approval for Cobas, a Zika test used for accurate diagnosis of diseases. Development of such new tests will ensure profits for the firm.